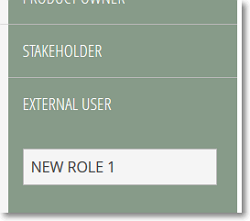 At the bottom of the list that shows the existing roles, click + NEW ROLE. This action replaces the + NEW ROLE button with an empty text box. In the empty text box, enter the name of the new role and then press enter on your keyboard. The new role is added to the bottom of the list that shows the existing roles for the current project, above the EXTERNAL USER role and you can start managing its access rights; for more details about managing the access rights for a role, you can go to Managing access rights. 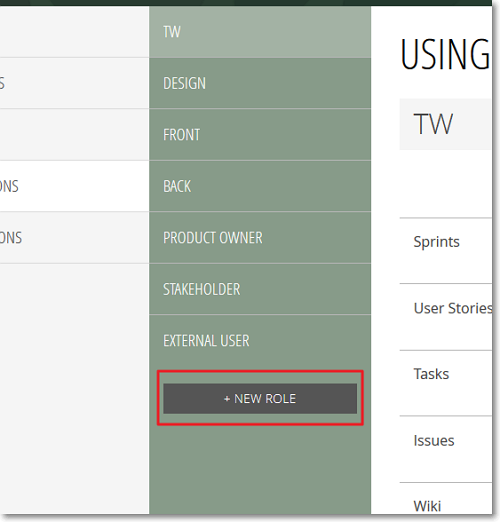 Note: By default, the new role has only View rights enabled for Sprints, User Stories, Tasks and Issues and no rights enabled for Wiki.